Like the strawberry fragrance at the local ice cream shop, Strawberry Swirl Scentsy Bar is blissfully sweet and creamy, with blends of frozen strawberry, frothy milk and vanilla. 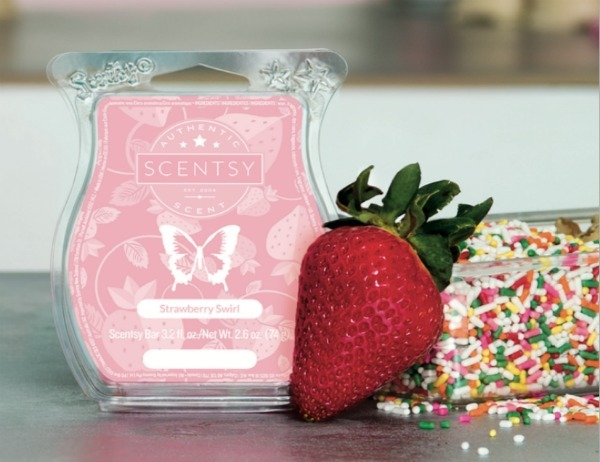 Strawberry Swirl Scentsy Bar refill is available online. This yummy new fragrance is sure to be a customer summertime favorite. With notes of frozen strawberry, milk and vanilla, just like your favorite ice cream shop. Add 4-5 cubes of Strawberry Swirl candle wax cubes to your favorite Scentsy wickless candle warmer and enjoy this refreshing treat for your nose. Scentsy Bars have a very low melting point and are best experienced when used in an electric Scentsy Warmer. With over 80 long lasting fragrances, including our Strawberry Swirl Scentsy Bar refill, there’s sure to be a favorite for everyone. Each Scentsy bar is scored to easily break into 8 cubes, and contains 3.2 fl. oz.